I love to cook, but I love to eat out too and people often ask me about my favourites. I have many, but if I want to eat out somewhere really special, I’m lucky enough to live in Bury St Edmunds which is home to the restaurant that TripAdvisor customers recently voted the sixth best fine dining experience in the entire country; French modern restaurant, Maison Bleue. I’ve been going there for years and it never fails to delight. If you want a warm welcome, amazing service, wonderful and imaginative food, a fabulous wine list and the best cheese selection on offer outside of France, this is the place to come. 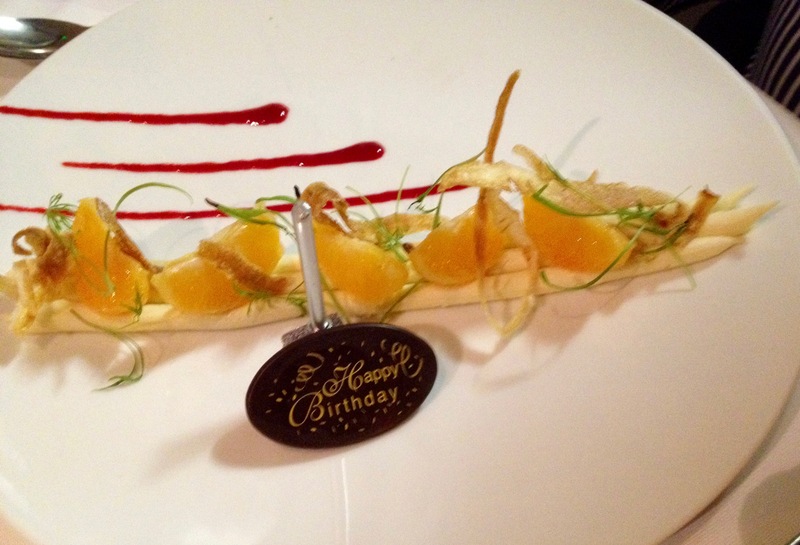 Brittany born Karine Canevet and her chef husband Pascal have made this a fine dining haven. I’ve eaten a lot a special things here, the squid carbonara, the pea velouté with poached egg and the twelve hour cooked Braeburn apple with salted caramel ice cream all hold a special place in my ‘palate memory’ but what I really love is something that isn’t on the menu unless you order it 48 hours in advance: the Plateau de Fruits de Mer. 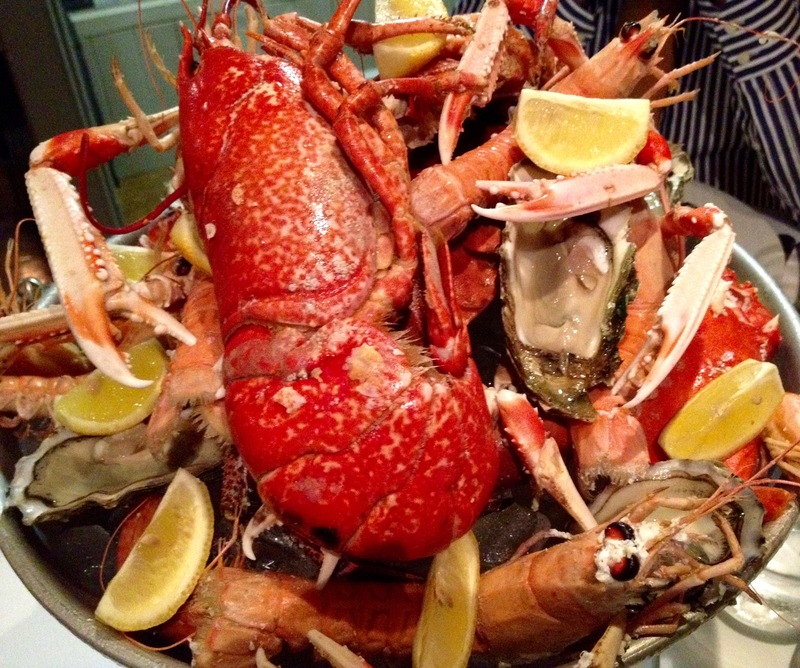 Lobster, crab, oysters, langoustines and tiger prawns with all the tools and trimmings! I took my partner Philip to eat it there when we first met twelve years ago, I think it was what first made him fall in love with me! We ate it there yesterday evening again for his special big 60 birthday – they’re both still as good as ever after all these years! Try it, I doubt you’ll be disappointed! 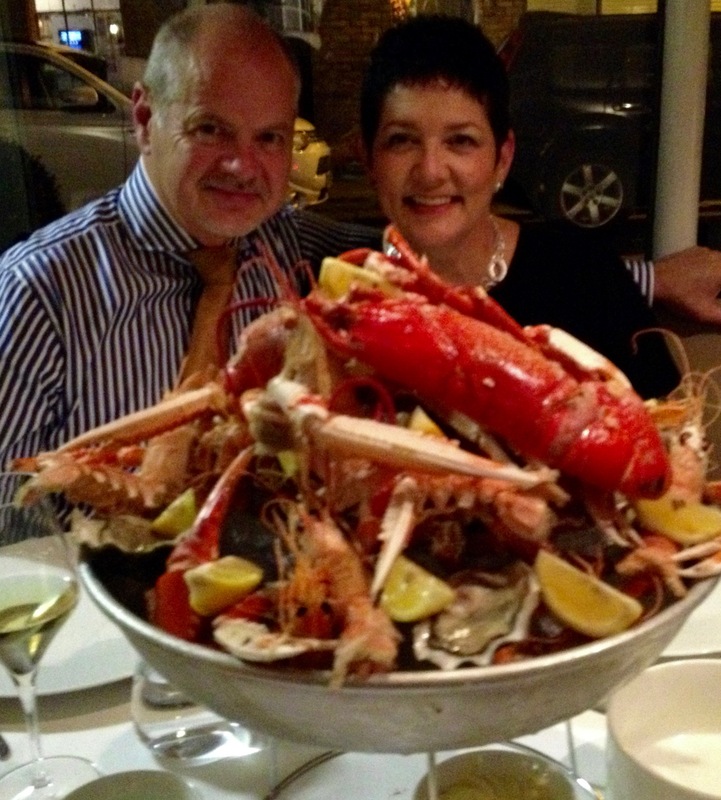 This entry was posted in Food and drink chatter, Recipes and tagged Bury St Edmunds, crab, Fine Dining, French modern dining, Karine and Pascal Canavet, lobster, Maison Bleue, oysters, Plateau de Fruits de mer. Bookmark the permalink. Great post – sounds like a lovely place! Happy birthday to your partner!